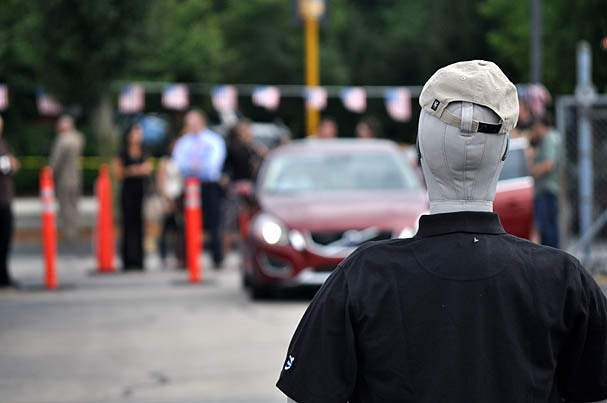 Bob the dummy stands in the path of the 2011 Volvo S60. Volvo, which in 2009 introduced the industry's first auto-braking feature on its XC60 crossover, has expanded the technology to detect pedestrians as well as cars. The original "City Safety" system uses laser sensors to detect slow-moving or stopped vehicles, and then measures that against driver input. If the driver isn't doing anything to avoid a collision, the car jabs the brakes and comes to a stop from up to 9 mph. The latest version, which debuts on the long-overdue 2011 S60, can halt the car from up to 22 mph, and when coupled with optional pedestrian detection, it's even smarter. Luxury sedans like the BMW 7 Series and Mercedes-Benz S-Class have used a similar pedestrian system on their night vision displays, but only to warn the driver as opposed to taking his control. The S60 — Volvo's mid-size and best-selling model — will debut this technology when it goes on sale this fall. Pricing starts at $38,550 with destination. The detection feature is a part of a $2,100 "technology" package. We sampled it during a public demonstration at Boston Volvo Village in Brighton, and while it's just as startling as in the XC60 we tested last year, the pedestrian detection seemed to get confused in crowds. In the last few seconds of the video below, several onlookers are standing to the far left and right of the car, but the S60 plows ahead. When no one stood near the dummy, the system worked fine.